We’ve made it through another winter, hoorah! As much as I miss the warm sunny weather I do enjoy the time to hibernate a little and practice yoga more restoratively. Often my body doesn’t feel like doing much at all in winter other than child’s pose, a back bend over a bolster and legs up the wall. Energy is rising though now with Spring. That feeling of “new” is in the air. My personal practice is getting more energetic and I’m beginning to challenge myself with new poses to master. Set a new intention. As well as new Spring energy there is a new moon coming up at the weekend so we’re building up to a perfect time to set a new focus for your practice and life. What do you want to create/ shift/ change? Write it down, remind yourself of it before you start your practice and at the end. Create a visual representation of it too if that helps plant it in your mind. If there’s a yoga pose you’ve been telling yourself you can’t do….perhaps now is the time to set yourself a challenge to master it. Clear out the old to make room for new energy. Declutter, detox, cut ties, get rid of anything that is stale or not serving you in your life; in your living space, your body and in your mind. If your practice has really slowed down to more of a mat based routine then start to do more sun salutations, get the prana (life force) moving in and out, and around your body. 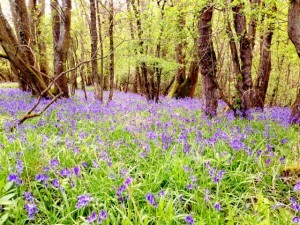 Spring’s energy is expansive, Open your arms a bit wider than usual feeling expansion through the chest and shoulders. Practice warriors to enhance powerful energy for forging ahead with your new beginnings and desires. In Chinese medicine they link Spring with the wood element, which is connected to the liver (and gallbladder). The liver chi (energy) helps us to get in to action to create the changes we desire in this period of growth and expansion. It’s in charge of our flow of vital energy and emotionally it’s linked to anger. When we feel angry or frustrated we can get stopped, or stuck, wound up and unable to move forward. Forgiveness and compassion to create harmony is key to help this energy flow. Yin poses that help the liver energy to flow are: Shoelace pose/ eye of the needle, sphinx, wide leg child pose, sleeping swan and dragon fly. Enjoy this wonderful uplifting time. This entry was posted in Yoga on April 13, 2015 by louise. I’m a big fan of mudras. That is yoga with your hands. There are loads of different mudras, hand positions, that you can hold whilst meditating that will heal different areas of the body. After loosing my voice last month and then recently running a workshop on the throat chakra I discovered this lovely one. It not only heals any problems in the throat but it also provides a real nurturing sense of connection with your higher self. It’s called the shell mudra, or shankh mudra. You wrap your right hand fingers around your left thumb and then place your right thumb tip on your left middle finger. So your hands look a bit like a conch shell. Then hold your hands in front of your sternum. Chant Om a few times and then sit in silence to allow the healing to flow, for about 15 mins. See your hands as a sea shell and the thumb encircled within as a pearl. Your left thumb is your higher self and you are wrapping your higher self in love. Allow your higher self to receive all it needs; love, support, a sense of security and confidence. Everything you need to be able to stay true to yourself and express yourself fully. Love it! It feels so lovely holding it. 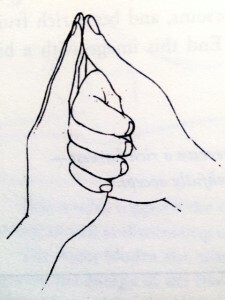 I found this mudra in a great little book called Mudra’s – Yoga in Your Hands by Gertrud Hirschi. My next workshop is next weekend, 11th April, 2-5 at Revitalise in Brighton. We’ll be focusing on the Third Eye chakra so it will be very slow, meditative, a chance to listen to your inner voice and connect with your purpose in life. There’s still a space left so please contact me if you’d like it. On May 10th I’m running a day workshop at Unity Studios which will be a journey through all of the chakras finishing with a healing gong bath. It’ll be a lovely day of me time, rebalancing your energy and healing. Details are on my workshops page. This entry was posted in Uncategorized, Yoga on April 1, 2015 by louise.